Anyone wanting to fundraise in a fun way by holding a contest. 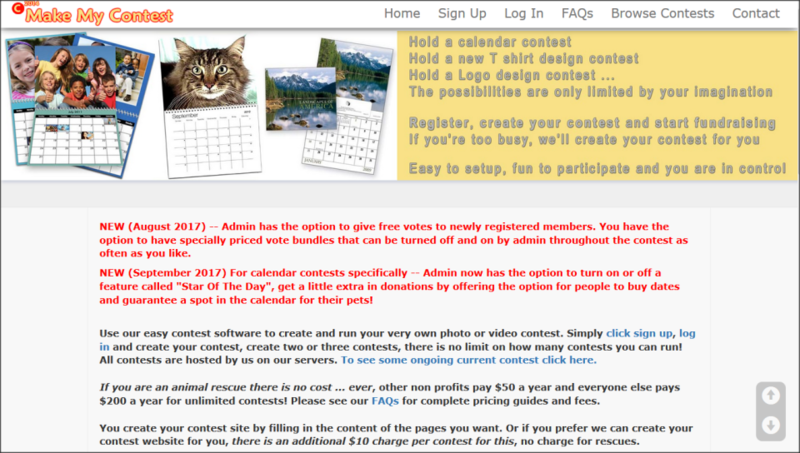 Photo, video, logo contest software for nonprofits to increase fundraising and engagement. Sign up for an account - Log in to your admin area - Click Create Contest. Enter the title (name) of your contest, click Create - Click pages, on this page you add the content you will have on your Home, Rules and Prizes pages, the Log in & Sign Up pages are already filled in by default so you don't need to add anything to them - Start your contest website and raise funds today! Make My Contest Reviews Recently Reviewed! S.E.O Expert, Digital Marketer. Managing Team. Building Digiatal Skills.